546 pages | 139 B/W Illus. In our increasingly globally interconnected world, understanding and appreciating the sociocultural context within which individuals make their decisions is critical to developing successful partnerships. 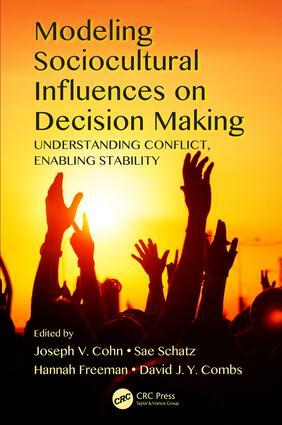 The collection of chapters in this volume illustrates how advances in information and social media technologies, as well as modeling and simulation tools, combined with the social sciences, can be leveraged to better understand how sociocultural context influences decision making. Case studies on the role of cross-cultural decision making grounded in current events and (in many cases) military applications. "The structure of the book is excellent and gives a framework for organizing ideas in this complex area. Hopefully books like this will by a catalyst for more work in the area and a further maturation of the models and what we can use them for." "I think this book will impact current and future work in the areas that form the intersection of applied social science, computer science, and sociocultural methods. It provides an integrated stance on very complex social and computational issues while retaining a sense for practical application. The book offers a nice blend of theoretical, methodological, and application-focused chapters that will aid a reader in learning about sociocultural topics and applying cutting-edge methods to the real-world issues. The editors have successfully compiled a diverse set of experts to explore very challenging issues that have very real implications for the military, and more broadly, the global business and social domains." Walter W. Kulzy, David J. Y. Combs, and Ronald D. Fricker, Jr.
Lewis A. Anderson and Ronald D. Fricker, Jr.
Champaign in 1993. He earned his PhD in neuroscience from Brandeis University in 1998.
as well as an associate fellow of the Aerospace Medical Association. and received industry awards for both her publications and her research efforts. PhD in human systems in modeling and simulation in 2008.
human rights, national and ethnic conflict, radicalization, political violence, and terrorism. David J. Y. Combs, PhD, earned his BA in psychology from Simpson University in 2003.
cross-cultural interactions within the irregular warfare context.